A research team led by Prof. Sanghyuk Lee at the Dept. of Life Science at Ewha Womans Univ. reports the identification of a recurrent RHOA mutation in angioblastic T cell lymphoma (AITL), in collaboration with Prof. Young Hyeh Ko at Samsung Medical Center. AITL is a common subtype of mature T cell lymphoma of poor prognosis whose molecular mechanisms are largely unknown. By exome sequencing of the tumor and matched normal samples from lymphoma patients, Prof. Lee’s group identified the RHOA Gly17Val mutation as the causal mutation of AITL, appearing in 24 out of 45 AITL cases (53.3%). They further demonstrated its oncogenic roles by cell line experiments. 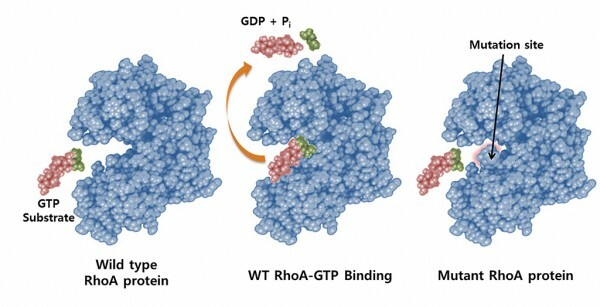 RHOA is one of mammalian Rho GTPases binding both GTP and GDP, with the GTP-bound forms being in the active conformation and transducing signals through the binding of effector proteins. 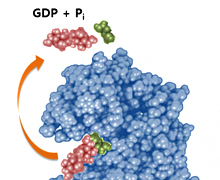 Structural modeling as well as functional studies have shown that the RHOA Gly17Val mutant cannot bind GTP and acts as a dominant-negative signaling protein (Figure). They further provided a global signaling model for AITL oncogenesis by integrating pathway knowledge with expression and mutation data, highlighting the role of RHOA-PI3K-AKT pathway axis coupled with the T cell receptor signaling. This work was published in Nature Genetics (April issue of 2014). Yoo HY et al., Nature Genetics (2014), 46(4) : 371-375. Highlighted in “Cools J, Nature Genetics (2014), 46(4) : 320. A recurrent inactivating mutation in RHOA GTPase in angioimmunoblastic T cell lymphoma.